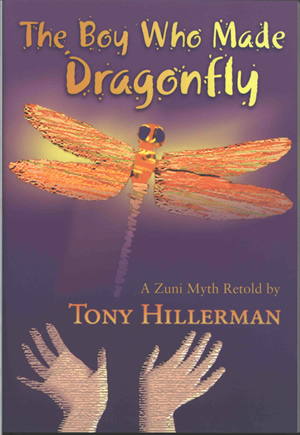 This ninth reprinting of Tony Hillerman's retelling of the Zuni story The Boy Who Made Dragonfly was published in 2003 by the University of New Mexico Press. The cover design and illustration is by Mina Yamashita, and features a large dragonfly in shades of red, orange and yellow, above a child's hands, on a purple background. The title and author's name are printed in orange to yellow gradients. The inside front and inside back covers are blank. The title, publisher logo, and author last name are printed horizontally on the spine. The back cover shows two small versions of the dragonfly illustration from the front cover, the book title, author name, illustrator name, synopsis, publisher name and contact info, and barcode.